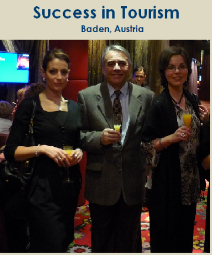 Dr. Michael Angerer, Commercial Counselor at the Embassy of the Republic of Austria. In recent years, the Bulgarian-Austrian business relations developed very dynamically, particularly in structure dominating sectors of our economy. With efforts toward further education and training of executive managers complying to European standards, the European Management Centre and its Bulgarian and Austrian partners participated actively in this process. The Bulgarian-Austrian Management Forum was initiated by the Federal Economic Chamber of Austria under the guidance of Prof. Mag. 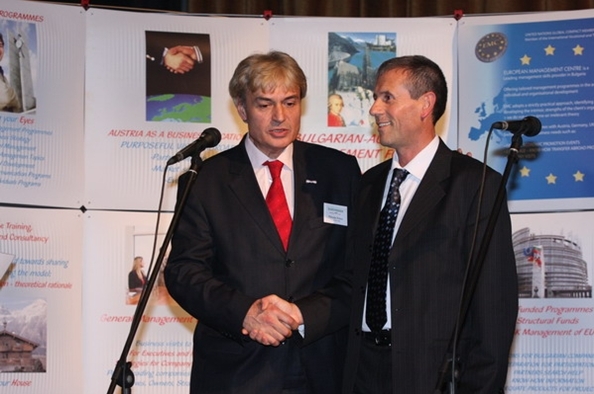 Stefan Hlavachek, Direktor of WIFI - International know-how transfer, and celebrated with a 15-year anniversary of the Bulgarian-Austrian Relations Management. The Forum was established to stimulate the economy of Austria and as a result the intergovernmental agreement between Bulgaria and Austria was signed in 1993. The partnership between the Federal Economic Chamber of Austria and the European Management Centre persists since 1999; the Centre offers know-how transfer of knowledge and experience concerning company management in Bulgaria. 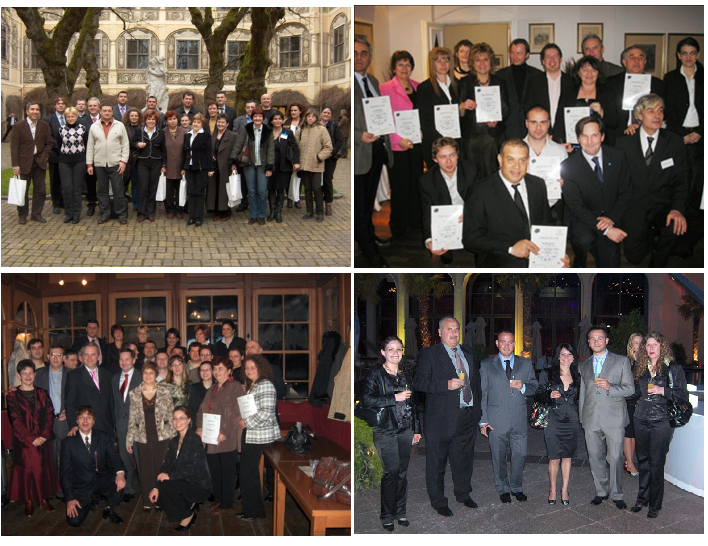 The European Management Centre coached over 1980 managers and employees from over 800 companies with numerous management programs. 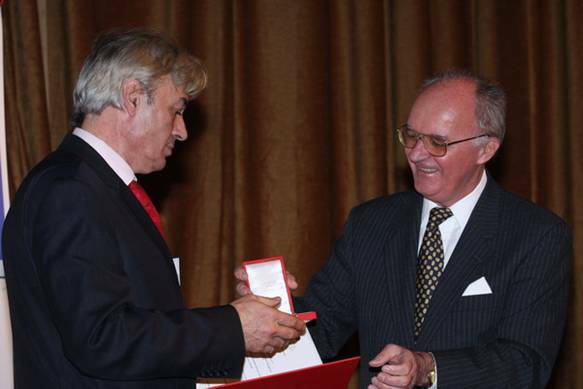 For special contributions to the Republic of Austria, Mr. Petroslav Petrov, Executive Director of the European Management Centre, was honored with one of the highest Austrian-state honors, the Golden Order of Merit to the Republic of Austria. 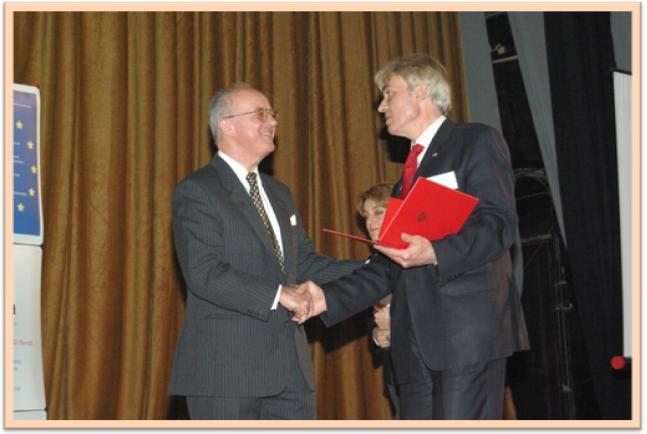 The award was presented by Mr. Klaus Fabian, Austrian Ambassador of Bulgaria. About 400 executives of leading companies and organizations, representatives of executive and local government, parliament, NGOs, academics, diplomats and media joined the event. Among the official guests were Mr. Peter Dimitrov, Minister of Economy, Mr. Henry Jacqueline, Permanent Representative of the UN Program for Development in Bulgaria, Mr. Octavian Buffalo, UNICEF Representative for Bulgaria, Mr. Paul Hansinger, Head economic department of the Embassy of France in Bulgaria, Mr. Simeon Sakskoburggotski, leader of the Simeon II National Movement and others. In recent years, the Bulgarian-Austrian Management community enlarged and strengthened the network of national and international partners by concentrating its activities in prioritized areas in Bulgaria, which acknowledges our country as successfully prepared for accessing the European market. As the initiator of the Forum and a key figure in these processes, the European Management Centre considers his main obligation in near future to play an decisive role concerning the stabilization of the country Bulgaria itself and the integration of the bulgarian economic and cultural institutions in the European structures. The Bulgarian-Austrian Management Forum is an institution of utmost importance for the development of Bulgarian - Austrian economic relations, mainly because Austria is an important partner of Bulgaria's economy and investor № 1 in Bulgaria. 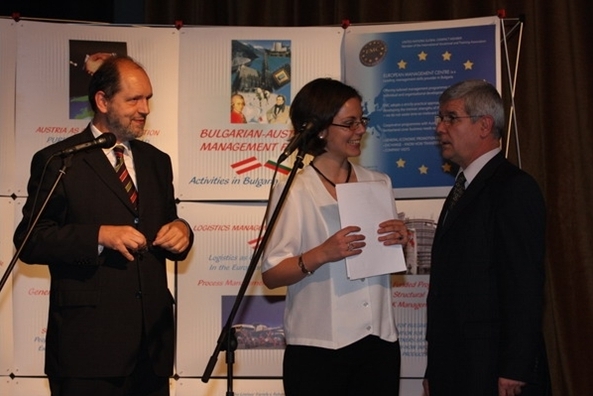 The Forum awards commendations to companies and organizations that participated most actively in the development of Bulgarian-Austrian Management concerns over the years and which imposed higher standards in their business, combining theory with practice. One of the programs these companies and organizations could participate in is called "General Management". 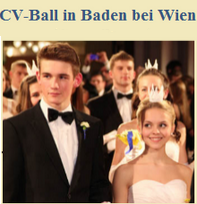 Furthermore business and culture organizations have the opportunity to accumulate knowledge and experience concerning austrian business and culture. In these years those companies and organizations became a successful model for developing businesses in our country. Prof. Stefan Hlavachek, long-time Director of WIFI - International Know-how transfer. "When we started together with the European Management Centre to design trainings for managers in Bulgaria, it was important for us, that after a while this initiative becomes a bulgarian one to serve the Bulgarian business. Congratulations on creating this Bulgarian institution working for the success of the Bulgarian-Austrian business relationships and congratulations to Mr. Petroslav Petrov for his personal merit." At the Forum business representatives of our country were awarded. Ivan Akov, businessman and president of the company Solid 55 Ltd, is one of the first Bulgarian who has completed the course in General Management and achieved knowledge about management strategies from EMC. "I am trained as engineer and I didn't know much about management in general - the course at the EMC was the first facility to encounter subjects of management. I evolved in the EMC certification programs in "Strategic management for leaders", "Professional management", "Leadership creation" and "General management". If there are any crisis, it is now possible to overcome them because of the good managerial training." Cyril Vatev, owner of Tandem-V Ltd: "The European Management Centre can take large credit for the education of our managers. I personally was also trained and got much experience from the consultants of EMC." Participants of the Forum were confident of good conditions for doing business in Bulgaria. The combination of low tax rates and social security burden makes Bulgaria very attractive to potential investors. Mr. Petrov Petroslav, Director of the European Management Centre, among groups of Bulgarian managers during a training in Austria.